Overhead costs for running a small business range anywhere from 40% to 70%. That's a huge chunk of your gross profits being recycled back into operations. You can try to get this number lower, but only if you are smart with your investments. 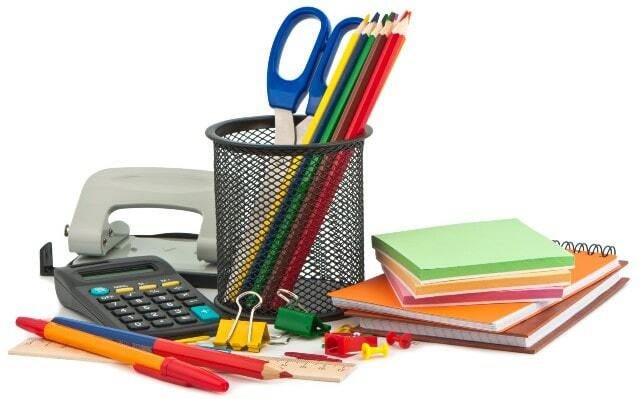 Basic office supplies can make up the bulk of your operating costs. It's important to have a strong supply of essential office supplies. If you don't keep a healthy inventory, you'll have bigger problems than squeezing profit margins. Here are office supplies you should never neglect. Buy boxes of the good stuff: paper, pens, scissors, calendars, paper clips, binder clips, post- it notes, and trash bags. We are more likely to cut corners on these supplies because they run out so fast. The truth is, you just need a reliable supplier that has competitive rates. Shop here for all your desk supplies and office basics. You can thank us later. No modern office is successful without the help of technology. Business phones, tablets, and computers are a must. You can get a lot of help from places like eBay or Best Buy's Open Box sections. The key here is to invest in quality brands, like Dell, Apple, and Microsoft, while getting everything backed by a great insurance policy. Your electronics can and will fail on you, so don't put yourself in a hole by wasting time and resources trying to fix them yourself. Your devices are only as good as your backup and security software. Use cloud storage to keep a copy of all your files at all times. Use trusted anti-viral, anti-malware, and firewall software on every device. Your printer should not be the cheapest inkjet found online at Target. In fact, you should really consider nothing less than a laser printer with plenty of toner cartridges. The time and money you'll spend on a standard home inkjet printer won't be worth it. If you'll print more than a couple hundred pages a day, then you'll need to invest in bulk to stem the bleeding. Paperless environments are the way of the future. Keeping things in their own designated place is a requirement for a smooth-running office. You will never forgive yourself for your poor organization if you lose an important document. Even if you do find it, the hours spent hunting for a piece of paper will leave a bitter taste. Instead, take yourself to Ikea or Lowes and start looking at smarter ways to file everything. Buy lots of dividers, binders, and files, then make each and every bin, drawer, shelf, and cabinet distinct from each other. If you handle a lot of outgoing mail, you're going to want plenty of mailers, boxes, bubble wrap, paper filler, and tape. In fact, tape and poly mailers will provide the best insurance on your packages. A lot of lost or damaged goods come from poor packaging. We recommend investing in some free USPS supplies, as well as the premium packing materials. Save postage by ordering through Stamps.com or becoming a member through a private carrier. A lot of what makes an office efficient and great to work at aren't found in folders, desks or cabinets. An office space should never feel like a cold, lifeless, muted gray prison. It needs to have the human element with natural accents and creature comforts. What does that look like? Well, for one, you could use some living plants in the office. Small, potted, indoor plants make the air easier to breathe and work a little lighter. Tap into some local artwork to bring some color and personality into your spaces. Weave in some motivational quotes, a-la Successories or printed memes. Make lots of room for achievements in the workplace. Have an open-window policy for both fresh air and vitamin D.
Decorate the floors and walls with rugs, murals, and cool dividers. You don't need to put up walls to divide spaces, though. Use velvet ropes, pylons, or fabrics, instead of plastic or carpeted walls. Improve your human resources department by fostering a natural and relaxing environment. No office is complete without furniture that encourages healthy habits. First off, you need to make sure everyone has a sit-stand desk. There's nothing healthy about sitting in a comfy office chair for eight hours a day. Next, allow for plenty of alternative furniture for relaxing and stepping outside the workspace. Beanbag chairs, stools, and hammocks break the mold of the office environment. If you invest in these types of basic office supplies from the beginning, you'll save yourself the stress of figuring out a way to fit it into your budget/schedule. Besides desks and chairs, look into storage spaces that are convertible or moveable. Being able to move and adapt your office space is important for growth. Needs expand and contract, layouts change and evolve, so prepare for that now while you still have the budget. Okay, now that you know which basic office supplies you should prioritize, how do you budget it? Well, it's a bit situational, depending on your businesses' needs and deficiencies. You'll need to use your own judgment and poll your colleagues on what they think. Including your staff on upper-level management decisions like these will foster trust and confidence in the company. If you're looking for business advice on managing this overhead shuffle, you're in the right place. My Frugal Business is a treasure trove of advice on management. Here, you'll find advice on saving money to bootstrap your business and grow beyond the small business grind. They go beyond mom and pop profits and into the future of business investment and venture capitalism. It's all about building a foundation. It doesn't matter if you're an accountant, a plumber or a florist — some office supplies are used by everyone. Start with this list as your foundation and keep on growing from there.